After launching an app, Insurance Regulatory and Development Authority has launched a WAP site that helps you narrow down on the right insurance policy and double check premium rates. An iPhone app developed by Hyderabad-based YQ Soft Labs Pvt Ltd was launched by IRDA in October this year. 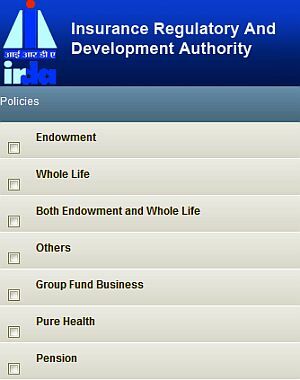 IRDA has announced that the app is available for Android, Nokia and Blackberry handsets too. The WAP site M.Irda.gov.in is for mobile users with Internet-enabled feature phones. They can access the same real-time information from the authority's database. The app and WAP site showcase policies from insurance companies, and allow users to search by the type of policy they require and keywords too. Policies for endowment, whole life, group fund business, pure health and pension are included, which allows you to learn about and compare them. IRDA has a comprehensive list of 21 insurance companies including Max New York, Bajaj Allianz, Future Generali, Tata AIG, HDFC Standard, Birla Sun, SBI, Bharti AXA, ICICI Prudential, LIC, ING Vysya, Shriram and MetLife India Insurance Co. Ltd. Currently, the app and WAP site lets you compare features such as benefits and premiums of Unit Linked Insurance Policies (ULIPs) introduced on or after September 1, 2010. "The objective of the application is to provide consumers a mechanism to make informed decisions by comparing features of insurance products on their mobiles," said J. Hari Narayan, Chairman, IRDA, in a Press release. Berkshire Hathaway recently expanded its online services in India and offers travel insurance products for individual, corporate houses, students, families and senior citizens. Meanwhile, online insurance sites such as Policybazaar.com, BankBazaar.com and MyInsuranceClub.com are still attempting to digitise the ecosystem. PolicyBazaar raised funds to focus on customer referrals, re-engagements, customer complaints on its website. India has a slew of online insurance sites - ApnaPaisa.com, i-Save, InsuranceMall.in, ApnaInsurance.com, Peacock Financial Advisors Pvt. Ltd's Getmeinsure.com, Click2Insure, Insurancepandit.com by A & M Insurance Brokers Pvt Ltd etc.